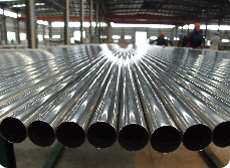 U-bend tubes are widely used in heat-exchanger systems. Heat-exchanger equipment on the basis of seamless stainless U-tubes is essential in strategically important and critical fields — nuclear and petrochemical machine building. Tubes of other alloys and steel grades can be produced upon agreement. -TEMA RCB 2.31 Standards of the Tubular Exchanger Manufacturers Association (9th edition). -ASTM A688 Standard specification for welded tubes of austenite corrosion resistant steel grade designed for feed water boilers. -ASTM B163 Standard technical requirements for tubes of nickel and nickel alloy for condensers and heat exchangers. BENDING RADIUS: from 1.5 OD to 1250 mm. When ordering tubes with R≤1.5D it is necessary to agree precision of geometrics. 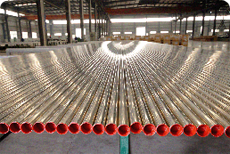 STRAIGHT TUBES MAXIMUM LENGTH (before bending): 26000 mm. Note: other sizes are available upon agreement. HEAT TREATMENT: Stress Relieved after U bending. HYDROSTATIC TEST: maximum test pressure 600 bar, soaking 10 sec. with demineralized water. Compressed air cleaning after hydro-test. Marking: before bending by marking machine all over the tube length (bent section after heat treatment without marking). Marking is also possible after bending on the straight parts of U-bent tube. Packaging: closed wooden boxes of corresponding dimensions for each tube length, radius, diameter, according to PO requirements or in bundles wrapped in polyethylene film with plastic clamping spacers on each tube.